The best way to ensure that a plant grows to its maximum potential is to give it want it needs. In the case of basil, it is a lot of warmth, plenty of bright sunlight and ample moisture. 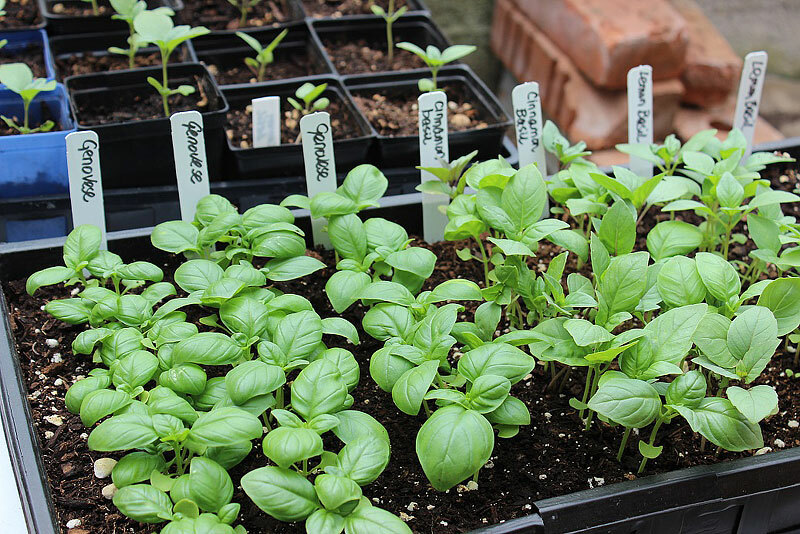 If you provide these, your basil seedlings will grow fast to become large plants, providing you with plenty of leaves for your pesto. If you keep your basil in the tiny pot it came in, you are not going to have a large, luxurious plant, even if you provide water and fertilizers regularly. The roots need space to stretch out, so transplant it into a larger pot or plant it out in the garden. If you are growing your plants from seeds, start them indoors early so that they will be ready to go outside when warm weather arrives. 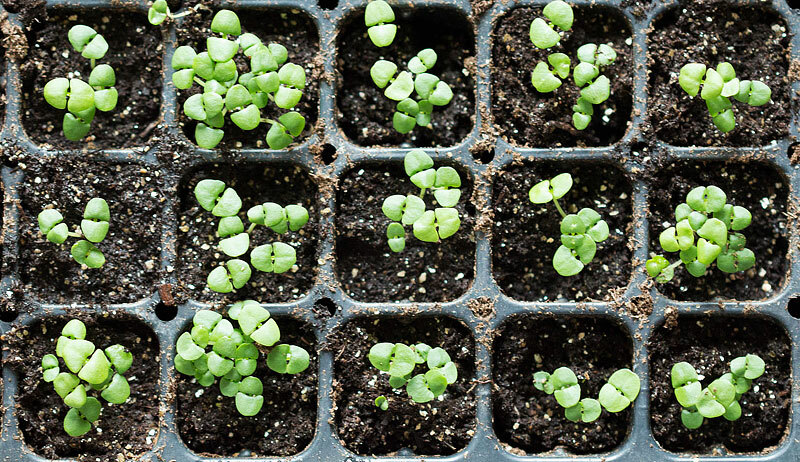 Use warm grow lights or heating mats to keep your basil seedlings warm. A constant temperature of 70F is ideal. Almost all varieties of basil are very tender, so they shouldn’t go outside until all danger of frost has passed. As a general rule, basil should follow tomato plants. In fact, both these warm-season plants have similar cultural requirements. If you have a long growing season, you can sow basil seeds directly in a well-cultivated spot or raised bed at the same time as you transplant your tomato seedlings. By the time the basil seedlings come up, it will be warm enough for them. Basil likes some amount of moisture in the soil all the time, but it doesn’t like wet feet. Rich growing medium keeps it happy, but good drainage should be ensured. Work the soil well to ensure good air circulation. 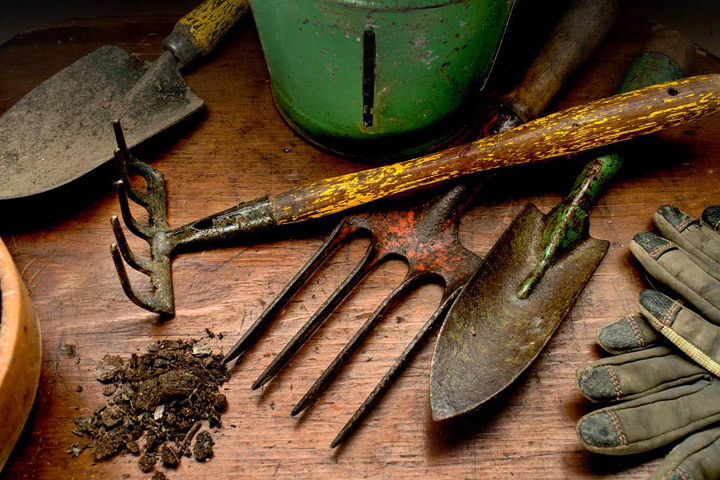 Amend the garden soil with compost, leaf mold, and other organic matter. Soil compaction retards growth, so ‘friable’ soil is what you should aim for. Add some high nitrogen fertilizer which helps leafy growth. For organic culture, vermicompost is excellent. Repeat feeding every two weeks with compost tea. 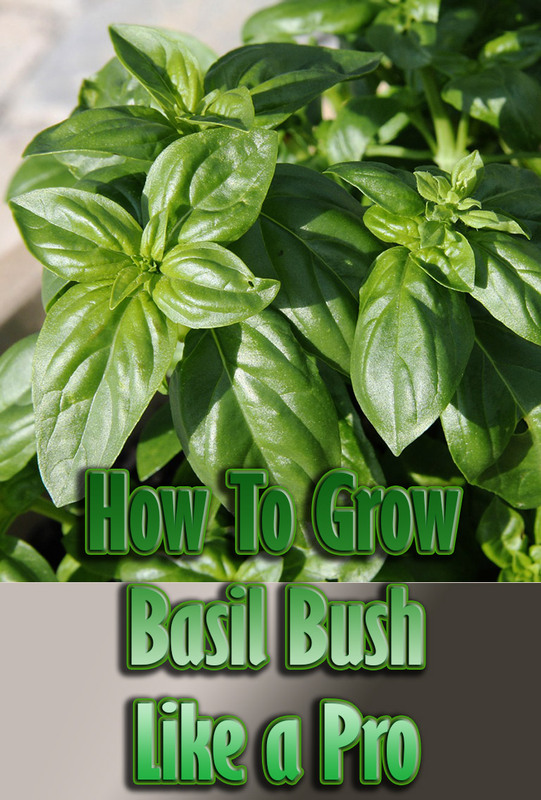 Most gardening advice regarding basil supports keeping the plant compact and bushy. But large plants provide more leaves. As you know very well, even a small quantity of pesto requires quite a large amount of leaves. If you want a large basil plant, refrain from pinching the tip when the plant is 6 inches tall as most gardeners advise. Allow the plant to grow fast and furious until it is between 12-15 inches tall. Pinch not just the apical bud and the first pair of leaves as you would normally do. Remove around 2 inches of the stem tip. This promotes branching from lower nodes. The side branches can be allowed to grow and fill out before their tips are pinched. They should be ready within 3 weeks. Continue to pinch off the tips of all branches and use them for making pesto and sauces. 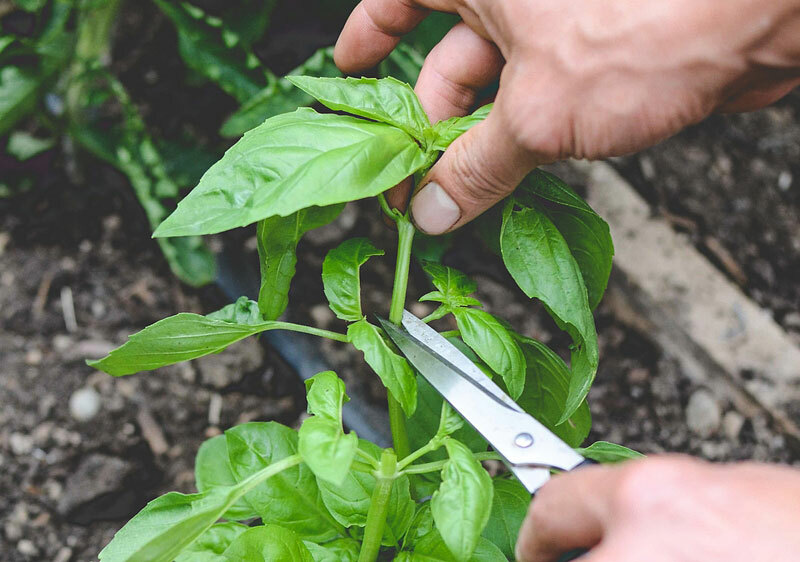 Frequent harvesting is important to keep your basil plant in a constant state of youthfulness. 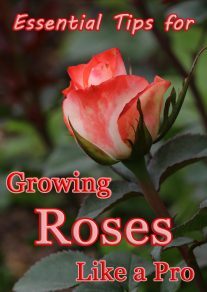 When it starts to produce new growth tipped with flower buds, pinch them off immediately. Flowering changes the flavor of the herb, so you always want to avoid this. All annuals have to wind up their life cycle sooner or later, but not before their basic purpose in life–procreation–is achieved. If they feel that their survival is under threat, they accelerate their life cycle, shifting their focus from vegetative growth to reproductive phase. In other words, they start producing flowers, which would eventually make seeds. When plants start their reproductive phase prematurely, it is called bolting. Summer heat, drought, and changes in day length are all triggers for bolting. In the case of some herbaceous annuals like spinach, celery, lettuce, and cilantro, once the plants start to bolt, there’s nothing much you can do about it. But basil is different. That’s because basil is not truly an annual. Most types can be grown as a perennial in warm climates, although the plants tend to look scraggly after flowering and the flavor may change. But, if you give it a good pruning and plenty of water, the vegetative growth starts again. Basils are easily grown from seeds, so gardeners usually grow them as annuals even in tropical areas. In temperate climates, this is the only way to grow them except in heated greenhouses. When your basil plant starts flowering prematurely, give it plenty of water and move it to a slightly cooler, partially shady spot. 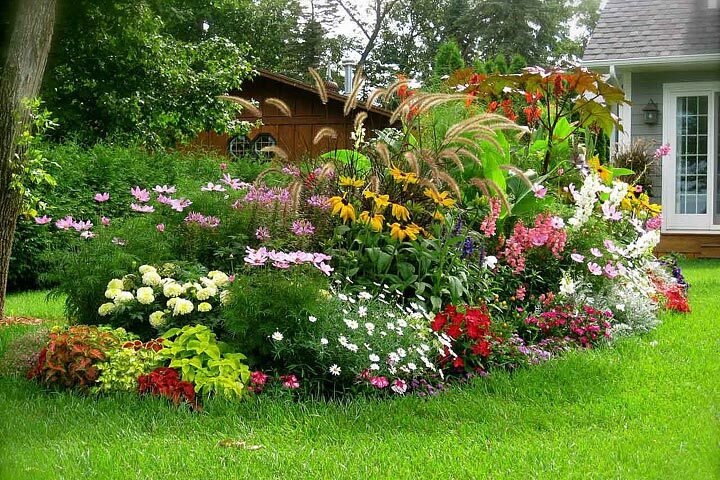 If it is growing in the ground, create some shade around the plant and keep a larger area around the plant moist. This helps raise the humidity and provide a more favorable microclimate for continuing the vegetative phase. A thorough pruning sometimes helps rejuvenate a listless plant. Basil plants belong to the mint family that gives us many aromatic herbs. Almost all varieties of basil now cultivated are mainly for culinary use, but their flavors vary greatly. There’s no harm in trying them out, but if you are not gastronomically adventurous, it is better to stick to the tried and tested ones. 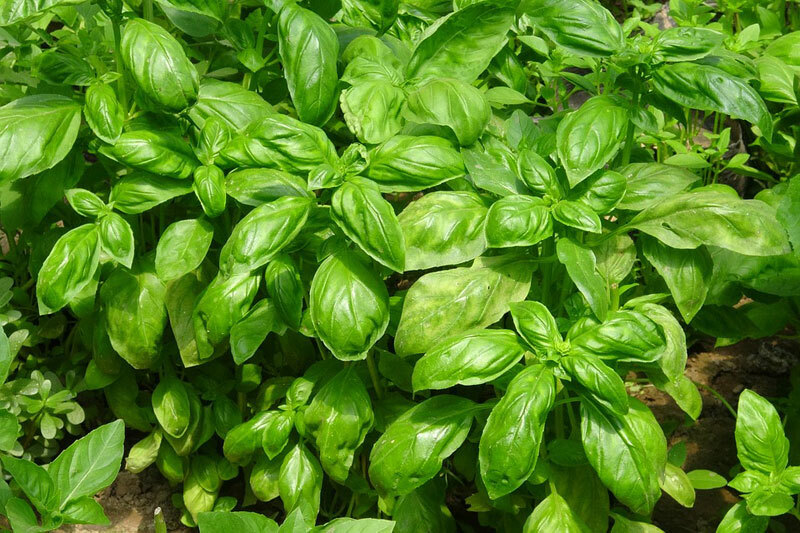 Genovese basil is regarded as the best choice for Italian pesto; Napoletano basil for pizza; Lemon basil for sauces etc. Sweet basil works just fine for most people, but Thai basil may be best left to Asian cooking.